This is the first milk chocolate Endangered Species Chocolate bar I have tried, and I approached it with some trepidation. I'm not a big fan of milk chocolate bars as a rule. I tend to associate them with bland, waxy, mass market "candy" like Hershey bars. Or I find them to be overly sweet, as I do many of the Cadbury milk chocolate bars. The technical differences between "dark chocolate" and "milk chocolate" kind of depend on who you're talking to, and what country they are in. 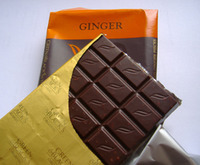 As a general rule, dark chocolate is cocoa plus fat and sugar. Milk chocolate is cocoa plus fat and sugar, AND milk. Take a perfectly good batch of dark chocolate, add some milk, and there's your milk chocolate. HI I LIKE THIS CHOCOLATE IT HAS GROUND UP ESPRESSO BEANS IN IT, IT IS REALLY GOOD, REALLY REALLY. Sorry, it's just that every time I eat one of the little squares of chocolate, I get KIND OF excited. Is it the caffeine? I'm not sure how much caffeine is in it. Some, surely, since it contains (as mentioned) ground espresso beans. 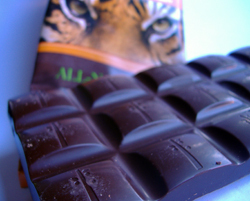 This bar, "the tiger bar," is my favorite Endangered Species Chocolate so far. And not just because tigers are kewl. (The tiger facts inside the wrapper mention that the markings on a tiger's face are unique, like human fingerprints. Which I already knew, because I have seen every nature documentary ever made.) Each pillow-shaped square has a semi-matte finish, and is stamped with the Endangered Species Chocolate symbol of a leafy branch. 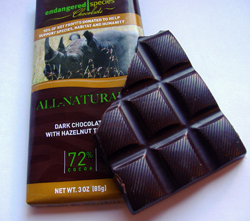 Endangered Species Chocolate is another one of the very small handful of Fair Trade chocolate companies here in America. They have a pretty extensive line of chocolates, and I have resolved to work my way through their product line. It's a tough job, but someone's gotta do it! Think of the children! Etc. This one has a rhinoceros on the label. I have learned that the label doesn't mean that your purchase specifically supports that species. Which honestly was a relief, because at one point ages ago I remember standing in the aisle trying to decide which I liked better: otters or manatees? It was too difficult a choice, flavor or species. I'm glad to learn that it's just the packaging! I'm learning that the Green & Black's line of chocolate is pretty much unassailable in every way. Their chocolates are made with organic ingredients, ethically sourced using fair trade to prevent human suffering and slavery, many of their bars are vegan-friendly, and best of all they are delicious. 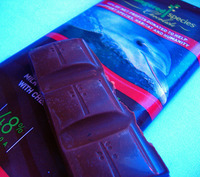 Green & Black's is one of the few fair trade chocolates which is available in America. (Although several mass market chocolate manufacturers like Cadbury and Mars have gone fair trade in the UK, the American versions of their bars are not fair trade.) They deserve your money for that reason alone, since the atrocities committed in the name of non-fair trade cocoa beans are truly horrific. When it comes to everyone’s favorite part of every holiday, food usually tops the list. July 4 is like any other holiday in terms of people coming together, celebrating their country’s birth, and cooking up some delicious flavors. Any Fourth of July celebration dinner would be incomplete, however, without some delicious desserts. Here are some simple yet delicious treats you might want to whip up this weekend. Red, White, and Blue Trail Mix: Dip some pretzels in white chocolate and serve with raspberries and blueberries for a sweet, juicy treat everyone can enjoy with their hands.